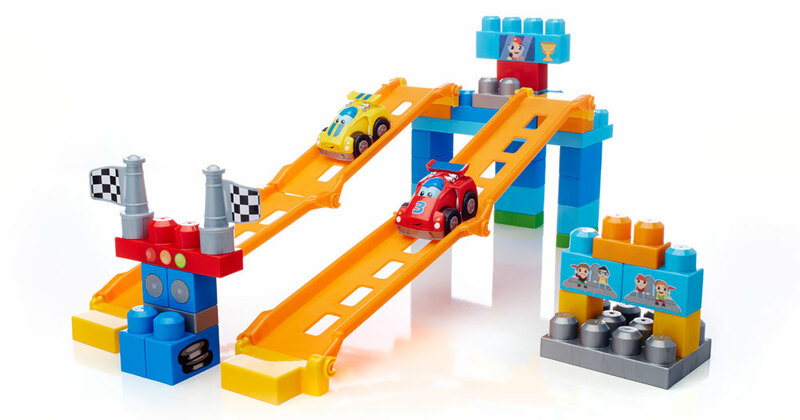 How adorable is the new Mega Bloks First Builders™ Fast Tracks™ Raceway ? While your little miss is busy designing her Barbie, your little mister can build a racetrack with the new Fast Tracks Racing Team by Mega Bloks First Builders. You and your children can mix and match the two racecars, and even customize them with included stickers. (Girls don’t’ get ALL the designing fun, after all.) Build up your racetracks and see who the winner is- best three out of five wins! Alternately, it is compatible with all other Mega Bloks sets, so you can build tracks in many shapes and sizes to race with. This set comes with two cars to build, 50 pieces, and sticker sheet. Available for about $20 at http://www.megabloks.com or stores near you. One of you can win this great prize- feel free to enter using the RC form below. Ends Nov. 4, 2014. Good luck! I would love to give them to my nephew. He loves building things. This would be for my grandchild. I am excited! I hope I win the prize. I would give it to my 1 year old and this would be his block set ever. I am excited! I hope I win this prize. I would love to win this Mega Bloks Fast Track Raceway for my son. It would be perfect for Christmas. I would give this to my son as he loves Megabloks. I have to admit though that I can see my daughter playing with it as well! I would give this to my son! He would so love this toy! I would love to give the Megabloks Fast Track Raceway to my nephew. It would make a fun gift for the holidays. My sons will love these! my oldest (11) says that he is going to become a construction worker when he is older 🙂 kids! I would give this to my nephews. They are just starting to like building toys. This would be perfect! I’d give this to my nephew…he’d enjoy it. I would give this prize to my oldest son! He loves cars and blocks so this would be the perfect present for him. I’d love to win for my kids. It would make a great Christmas gift! I would love to give this to my niece. She loves little cars, along with megabloks! I would give this to my nephew! He is obsessed with trucks and cars, so he would absolutely love this! I would love to win and give this to my nephews. They would love this. I would like to win the prize for the little boy across the street. I’m sure his daddy would have fun help him build it and race the cars. I would love to give this to my nephew Isaac who will celebrating his first Christmas and then first birthday in January! I would give this to my daughter Charlie if I won. I would love this for my son! this would be the perfect size for him. Mom son would love this! This combines two of my son’s favorite things, cars and blocks. He would get hours of fun out of this. I would give this set to my son. He loves Mega Bloks. I’d love to win this for my nephew. I am excited! I hope I win the prize. Thanks. my son will turn 3 in december and he will love it! He loves cars and he will be thrilled to have this! I would love to give this to my two sons. They would really enjoy it! My little guys loves playing with bloks and cars. I know he would love to play with this set. Thanks for the chance to win. I would probably save this as a Christmas gift for our little cousin. He’s at a great age for toys like this and my little ones always loved building toys! Thanks for the chance to win! I am excited! I hope I win the prize!! Dylan would LOVE this! He is just getting into that building stage and I think he would have so much fun with the Mega Bloks! I would really love to win this for my two boys! They really love cars and mega blocks so this is a perfect match! If I were lucky enough to win I would give this prize to my youngest son. We have some Mega Blocks sets already and my children love them. I’d give this to my sons. It’s the best of both worlds, blocks AND cars! I really would love to win this for my daughters twins because they love playing with the Mega Blocks that they already have. I would give this to my twins because it would go great with their starter kit of Mega Blocks! This would be a wonderful prize to give my grandsons this Christmas! They would love racing each other down the ramps! I will be giving this to my youngest grandson for Christmas. Thank you for the chance to win it for him. I will give this to my little grandson. He loves building things. I would give this to my nephew! Thanks for the great giveaways!! My cousin has two little boys who are less than a year apart in age. I would love to give this to them for Christmas and they could play with it together. I would love to gift this to my 4 year old nephew if I won.